Our highly dependable staff arrives with top of the line equipment able to clean even the toughest high traffic areas. Our staff will move and replace any heavy furniture, doing all the heavy lifting so you don’t have to. Hundreds of customers trust us to clean more than 1million square feet of carpet a year. Making us one of Toledo’s premier carpet cleaning companies for commercial and residential carpet cleaning. We know the proper care regimens for a variety of hard floor surfaces including vinyl, ceramic, quarry, tile, and wood. Our relationships with flooring manufacturers keep us abreast of proper care techniques, ensuring your floor’s long life and enhanced appearance. Your home or facility makes a statement to your guests, customers and to the outside world. Let us care for your upholstery, and other fabric surfaces that can accumulate dirt, dust, and grim, leaving your guest with the right impression. We work from your list for Spring Cleaning. Can include wall washing or brushing down walls, windows, moving furniture, washing baseboards, carpet / upholstery. Options: Taking drapes to the cleaners and rehanging. Just ask and we’ll do it! Other Services Offered: Move In / Move Out Cleaning, Window Cleaning, Pet Odor Treatment, Wash and Fold Service. We have given you a few suggestions and want to encourage you to tell us your “Special Requests.” The Cleaning Genie offers you flexibility in time and price. 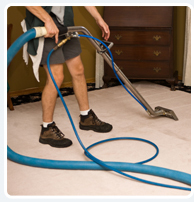 Our specialty services range from carpet and upholstery to disaster and restoration. No job is too small or too large for Cleaning Genie. If you do not see what you need please call our office to hear more about our services and how we can help or do so by filling out the form below.